Windows XP Support is ending soon! MSE for XP ending too! After April 8, 2014, technical assistance for Windows XP will no longer be available, including automatic updates that help protect your PC. Microsoft will continue to provide updates to our antimalware signatures and engine for Windows XP users through July 14, 2015. Changing the Networking settings from Shared Networking (NAT) to the host’s physical network card (NIC) comes up a lot in the forums for XPmode-WinVPC, here are a couple ways to do it. 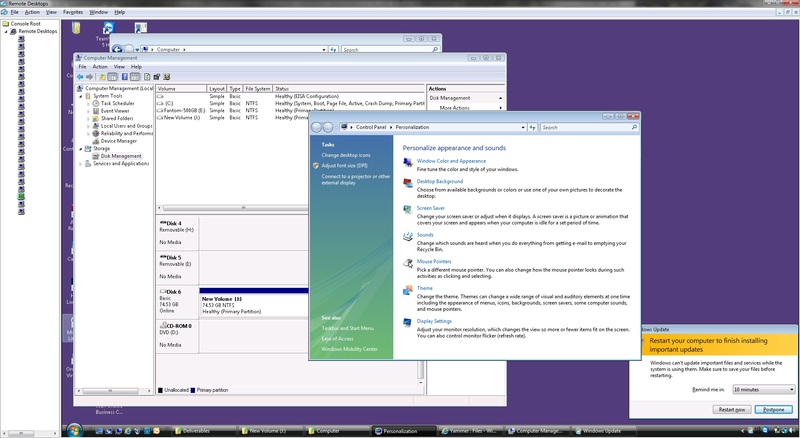 The XP Mode settings or any WinVPC virtual machine are accessed from Windows 7. When selecting the NIC you want to use, make sure you select your active NIC. Your active NIC is the one that is connected to your local network and is how you access your network. The active NIC can be wireless or wired, or in some cases both your wireless and wired connections may be active. Click once to select XP Mode. Next, click Settings from the menu bar. Select Networking. 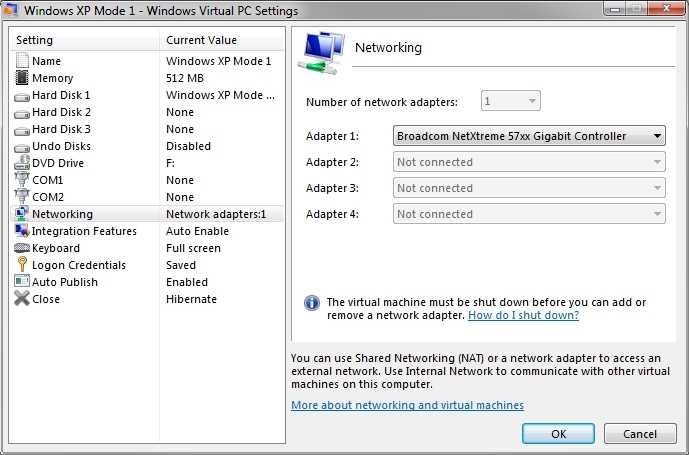 From the Adapter 1 drop list you can select the host’s active NIC to allow XP Mode to be on your local network. You will need an available IP address for XP Mode. 2. From the XP Mode window, click the Tools menu on the XP Mode window menu. Select Networking. From the Adapter 1 drop list you can select the host’s active NIC to allow XPMode to be on your local network. You will need an available IP address for XP Mode. In this case, the active NIC is a Broadcaom NetXtreme 57xx Gigabit controller. Your NIC may not be the same. If you do not have a DHCP server, then you will manually need to enter a unique IP address for XP Mode in the same way you did on your Windows 7 computer. 2. There are no DHCP servers available to lease an IP address or there are no available IP addresses on your network. This follows along with the XPMode post for 24-bit color. The default for XP mode is 16-bit color, but everyone “needs” 32-bit color. I needed to restore my Toshiba M400 Tablet to it’s factory build at work today, but I’d forgotten to bring in my Restore DVDs. Fortunately, I found a short-cut that allows you to restore the system directly from the hard drive. Hold down ‘0’ (zero) during boot and you’ll go into the Toshiba recovery console. About 30 minutes later I was running through the Windows XP initial boot questions. Worked for me. You’re re-registering the following DLL-files.